Lactic Acid Bacillus 120 Million spores. Offers broad spectrum of activity against gastrointestinal pathogens,including E.coil and species of Salmonella,Shigella,Campylobacter Yersinia,Plesiomonas,Aeromonas and vibrio. A total cure achieved in 96.5% of cases with diarrhea and in 100% of cases with dysentery. 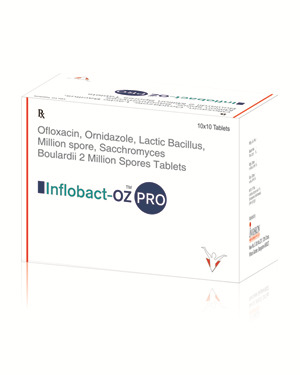 Combination of ofloxacin with ornidazole significantly reduces number of watery stool and associated symptoms like nausea,abdominal pain. Shows tolerability rate of 98.43%. Helps in normalising intestinal flora & elicits positive results in treating acute infections diarrhoea. Alleviates bacterial/viral induced diarrhoea espically in infants. Significantly reduces the duration of diarrhea from -26.05 to -13.34,stool frequency -1.38 to -0.10 after intervention compared with control. Inhibits & neutralizes bacterial virulence factors.